Arachuvitta sambar | Sambar from homemade sambar powder – is made with freshly ground spices, it is so aromatic and flavorful. 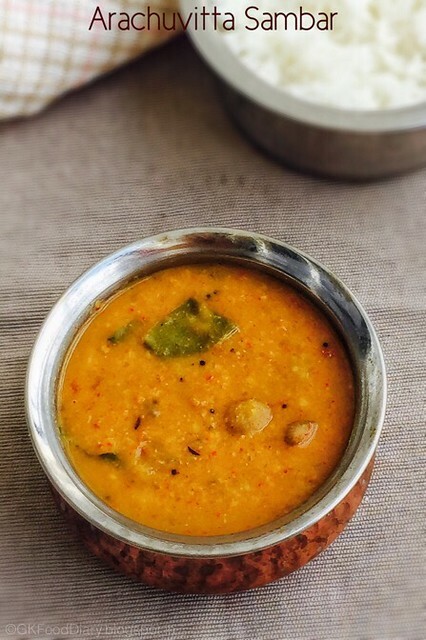 Generally this sambar is made with mixed vegetables like broad beans, drumsticks, pumpkin and brinjals. 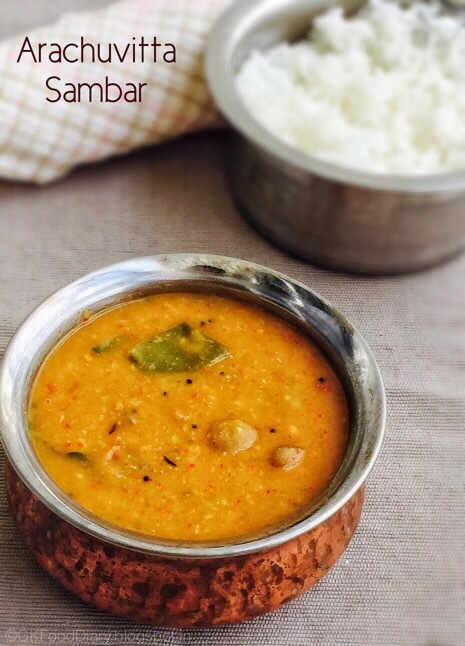 The taste of this sambar is close to the traditional sambar served in South Indian weddings. I usually stock up with homemade sambar powder which is very handy and make sambar (check out the drumstick sambar recipe which I posted a while back) with that. 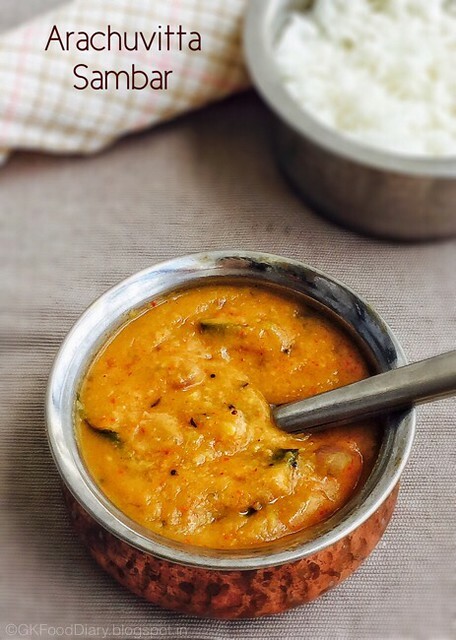 This arachuvitta sambar recipe comes to my rescue when i run out of homemade sambar powder as I don’t prefer store bought ones. 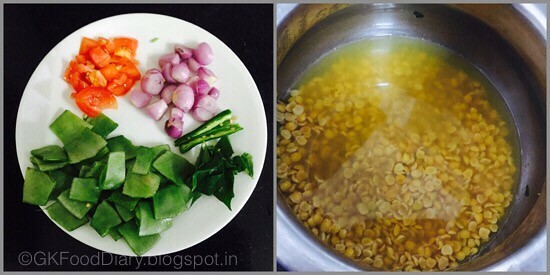 Let’s check out how to make this aromatic arachuvitta sambar. Arachuvitta Sambar Recipe - South Indian style aromatic sambar with vegetables and freshly ground spices. Take your vegetables and wash it twice in running water. Then chop them to the desired size. Peel the small onions and chop the tomatoes finely. Keep aside. Pressure cook the toor dal in a small pressure cooker with a cup of water for 3 whistles or until soft. Mash the cooked dal well with a laddle once pressure releases. Set aside. Heat a pan with ½ tsp of oil and add the ingredients mentioned in 'to roast and grind'. Fry them until they turn golden brown and nice aroma comes. Switch off the flame and cool it down. Take the roasted spices to the blender and grind it to a little coarse powder. Set aside. Soak tamarind in warm water and extract the juice. Add 2 cups of water to the extracted tamarind. Keep it ready. Heat a tsp of oil in a pan and add the items to temper. Let the mustard cracks and urad dal turns brown. Add curry leaves and fry for a minute. Then add small onions and green chillies.Saute them well for 5 minutes or until the onions turn brown. Add tomatoes now. Fry them until they turn soft and mushy. Once the tomatoes are cooked well, add vegetables and fry it for a minute. Then add turmeric powder and salt. Fry it for another minute. Then add tamarind water and mix it well. Bring it to a boil. Once the raw smell of tamarind leaves, close the lid of the pan and cook the vegetables for 10 minutes or until done. 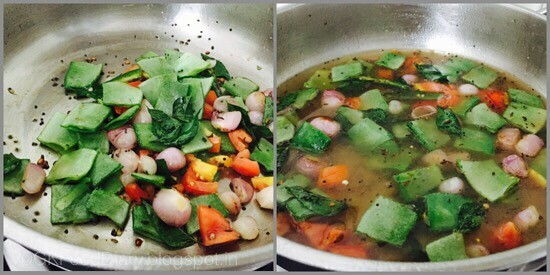 Now the sambar becomes little thick and cooked vegetables will be soft. Add the mashed toor dal and mix slowly. Add a cup of water if needed. Boil the sambar again for five more minutes in medium low flame. 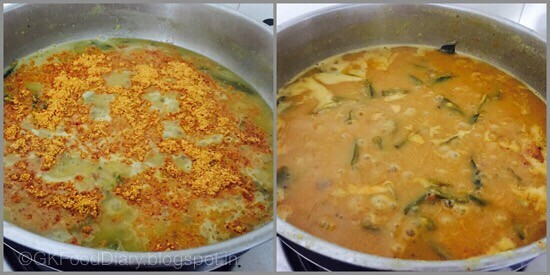 Once the sambar becomes slightly thick, add freshly ground sambar powder slowly. Mix well to without forming any lumps. Boil the sambar again for 5 more minutes. Switch off the flame once the sambar becomes slightly thick. 1. 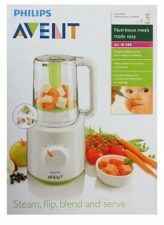 Take your vegetables and wash it twice in running water. Then chop them to the desired size. Peel the small onions and chop the tomatoes finely. Keep aside. Pressure cook the toor dal in a small pressure cooker with a cup of water for 3 whistles or until soft. Mash the cooked dal well with a laddle once pressure releases. Set aside. 2. Heat a pan with 1/2 tsp of oil and add the ingredients mentioned in ‘to roast and grind’. Fry them until they turn golden brown and nice aroma comes. Switch off the flame and cool it down. 3. 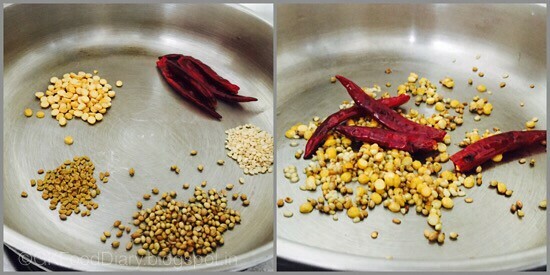 Take the roasted spices to the blender and grind it to a little coarse powder. Set aside. Soak tamarind in warm water and extract the juice. Add 2 cups of water to the extracted tamarind. Keep it ready. 1. Heat a tsp of oil in a pan and add the items to temper. Let the mustard cracks and urad dal turns brown. Add curry leaves and fry for a minute. Then add small onions and green chillies. Saute them well for 5 minutes or until the onions turn brown. Add tomatoes now. Fry them until they turn soft and mushy. 2. Once the tomatoes are cooked well, add vegetables and fry it for a minute. Then add turmeric powder and salt. Fry it for another minute. Then add tamarind water and mix it well. Bring it to a boil. 3. Once the raw smell of tamarind leaves, close the lid of the pan and cook the vegetables for 10 minutes or until done. Now the sambar becomes little thick and cooked vegetables will be soft. Add the mashed toor dal and mix slowly. Add a cup of water if needed. Boil the sambar again for five more minutes in medium low flame. 4. 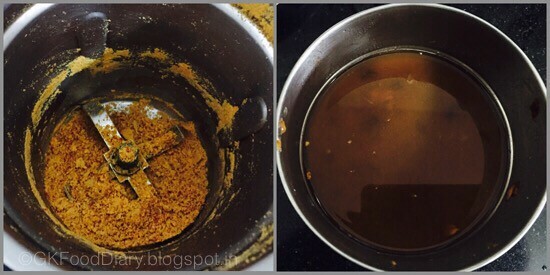 Once the sambar becomes slightly thick, add freshly ground sambar powder slowly. Mix well to without forming any lumps. Boil the sambar again for 5 more minutes. Switch off the flame once the sambar becomes slightly thick. 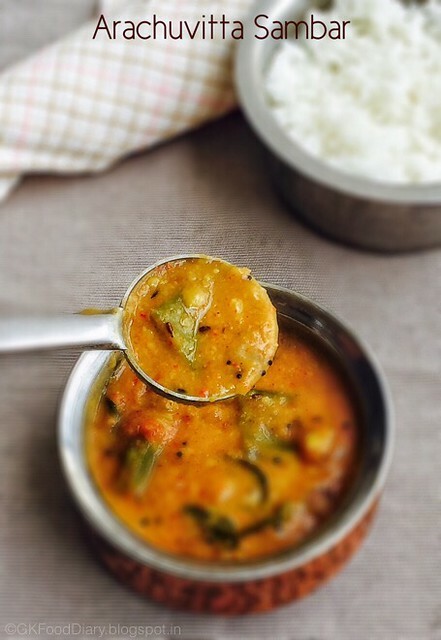 Serve the sambar with hot steamed rice and any stir-fry/kootu of your choice! You can add 2 tbsp of coconut while roasting the spices for variation. This sambar tastes best even without adding coconut. Sambar thickens with time so switch it off accordingly. 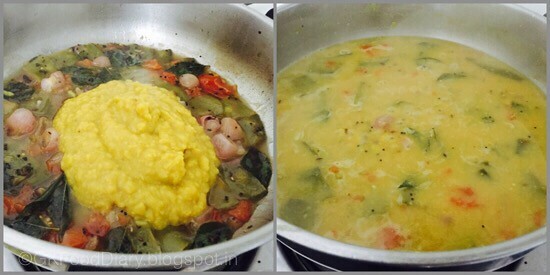 Sambar should be neither thick nor too thin. Add water appropriately. 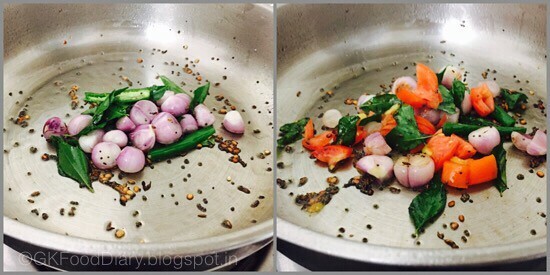 Garnish with coriander leaves at the last stage if you prefer. Small onions works best for sambar. But you can use big onions too. Use 1 medium sized big onion if using.